I was always an active kid. As soon as I could run, I was playing soccer, doing gymnastics and skiing. A few years later I was also playing basketball, volleyball, softball, tennis, swimming and track and field. By the time I was 10, I was in love with sport. Fast-forward 20 years, I am a successful, world class rugby player. 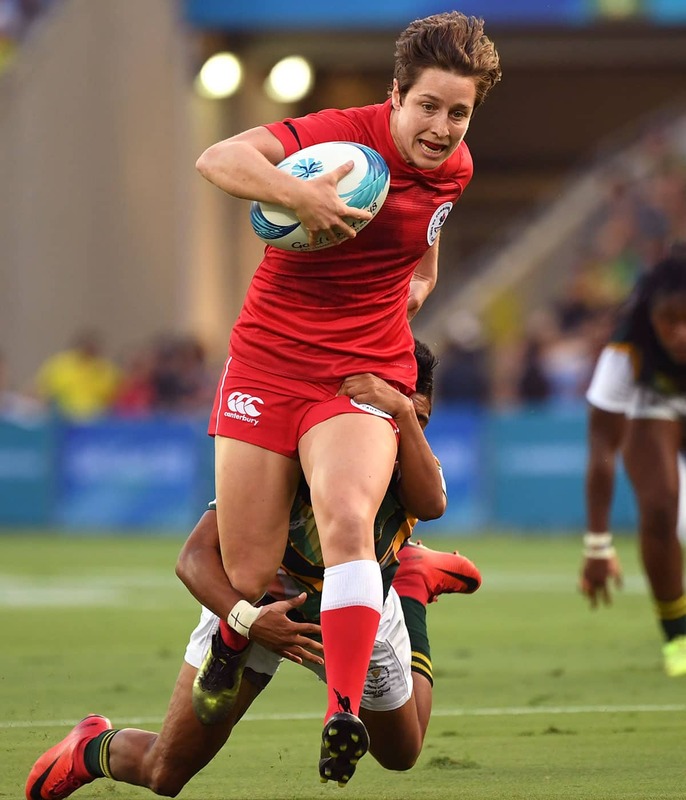 I travel the world for sport, I’m the current all-time points leader on the Women’s Sevens World Series, I have won an Olympic bronze medal, a Pan Am Games gold medal, a Rugby Sevens World Cup silver medal, and a total of 19 World Series medals. For the last seven years, I’ve been a full-time athlete. I grew up in Toronto, in a community that valued, developed and supported community sport programs. Every weekend, I played house-league soccer with the North Toronto Soccer Club. I went to Allenby Public Elementary School, which, led by our dedicated physical education teacher Mr. Galofaro, gave me the opportunity to practise and play a lot of sports. By the time I got to high school, I had developed a solid athletic foundation. This is when my athletic future changed forever. By luck and circumstance, I went to one of the few high schools in the city that had an established rugby program. Lawrence Park C.I. was one of the first high schools in Toronto to establish a boy’s rugby program in the 1970s. Cecil Moody, a history teacher and avid rugby supporter, was an early champion of the cause. Twenty years later, my older sister, Alexie, was part of the first girl’s rugby team at the school in 1997. Meanwhile, I was dreaming of when it would be my turn. Unlike many of our international competitors (New Zealand, Australia, England), rugby wasn’t a well-known sport in Canada back then. It was never on TV and I didn’t know anyone else who played it. I eagerly started playing rugby in Grade 9. I weighed barely 100 pounds, one of the smallest players on the field at any given time, and pretty unthreatening to the opposition. I had no idea what I was doing. I still didn’t know the rules, and I recall one of the coaches telling me, “You’ll figure it out,” before my first game. Rugby combines so many different movements, skills and vision that all my years of playing other sports allowed me to excel right away. I quickly learned I could compensate for my small size with speed, agility and tactics. Slicing through the defensive line became an endorphin rush. Having one of the smaller players for a daughter made my mom a nervous spectator, shrieking and screaming at every contact, while my dad quietly showed his belief and support in me. From a young age, they both taught me that I could do whatever I wanted — no restraints, no barriers. They both came to as many games as they could. Turns out, that early coach was right, I did figure it out. When I started playing rugby, it was love at first sight. I didn’t choose rugby because I saw a future of playing professionally or going to the Olympics. None of that even existed for women’s rugby at the time. I was well into my career before the Women’s Sevens World Series was created. Women’s rugby debuted at the Pan American Games in 2015 in Toronto, then the Olympic Games in 2016 in Rio de Janeiro, and at this year’s Commonwealth Games. So I had no idea what the future held back then, but I knew I loved the game. Rugby has given me passion, purpose and joy. It has taught me lessons in teamwork, friendship, confidence, attitude, overcoming challenges and leadership. I have met many of my closest friends through rugby. There is a lot of discussion about the merits of early sport specialization - but take me as a living example of an argument against it. I strongly affirm that my young exposure to many different sports had undeniable positive effects on my athletic career and success. Playing a variety of sports let me develop an array of athletic skills; running, jumping, balance, body awareness, kicking, throwing, catching, change of direction, hand-eye coordination — all of them key to rugby and nearly every other sport. Many factors have to come together to build a successful sport career. In my case, the most important things were a lot of training hours, hard work, a very supportive family, teammates and coaches who believed in and inspired me. But all of it was built on the foundation of being a young kid with the opportunity and environment that let me play, develop and have fun. A: Sacred Hoops by Phil Jackson. A: “Hard work beats talent, when talent doesn’t work hard." A: "Trust your gut,” but I don’t think I overuse it, I think people undertrust it! A: I love interior design. A: My late grandfather, Justin Trudeau, Billie Jean King, Van Morrison, Steve Kerr and my niece (she’s almost 3). A: Win a World Series title.